40170 Build My City Accessory Set represents a considerable departure from the standard LEGO CITY range as minifigures are omitted altogether in favour of small models which are intended to furnish an urban environment. The set is somewhat reminiscent of the service and accessory packs prevalent in past decades and I am very pleased to see such a concept return, particularly given the low price of £7.99 or $9.99. Hopefully this and the corresponding 40264 Build My Heartlake City Accessory Set are the first among several of these little packs! The set contains nine models, ranging in size from a simple road sign to a parking attendant's booth which can house a minifigure, although none are included. 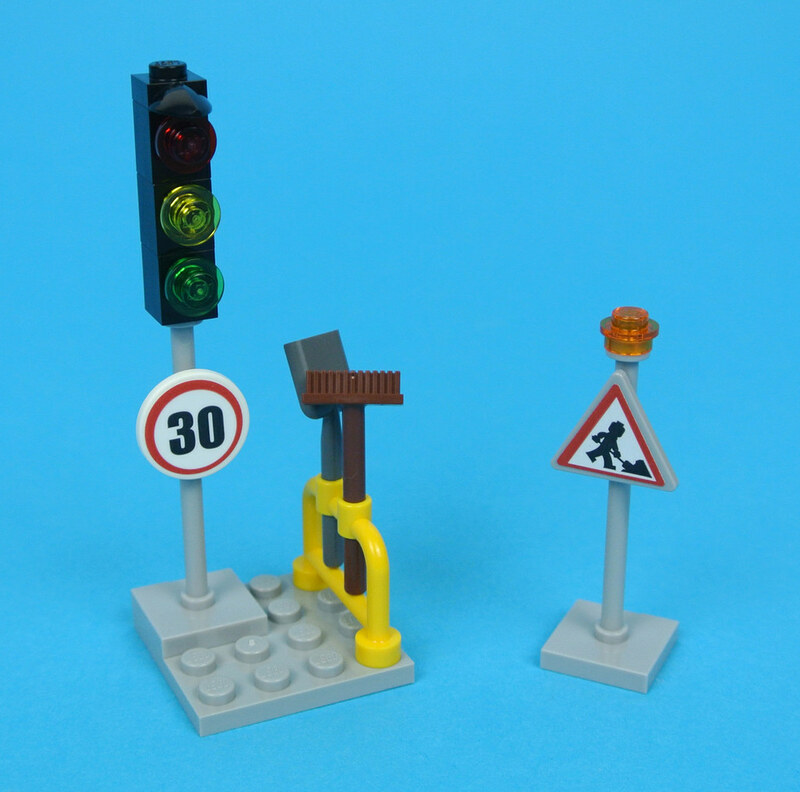 The first road sign warns of construction ahead and shows a minifigure using a shovel while the second sign displays the speed limit. Both are reliant upon stickers and the latter is attached to a simple traffic light. A rack of tools completes the construction zone. Another stickered sign, this time marking a bus stop, is fitted to a lamp post which is constructed using a light bluish grey pole and some click hinges. Similar lamp posts have appeared in many recent CITY sets so it is pleasing to see some consistency across the range but the click hinge at the base tends to wobble slightly which is frustrating. 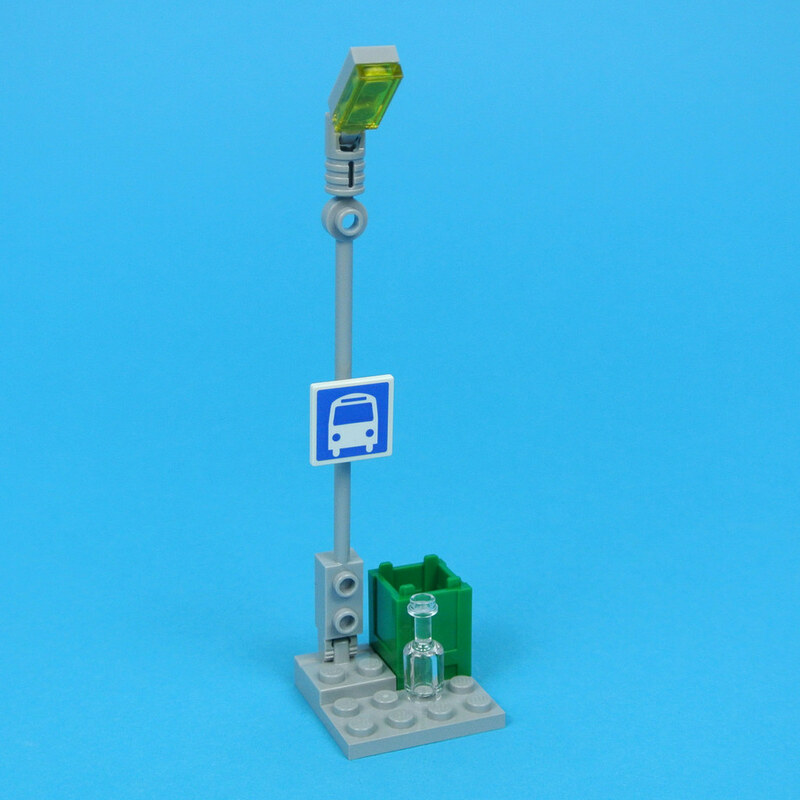 The green recycling bin and trans-clear bottle situated beside the lamp post are very welcome as both elements are fairly rare and have never appeared in such an inexpensive set before. 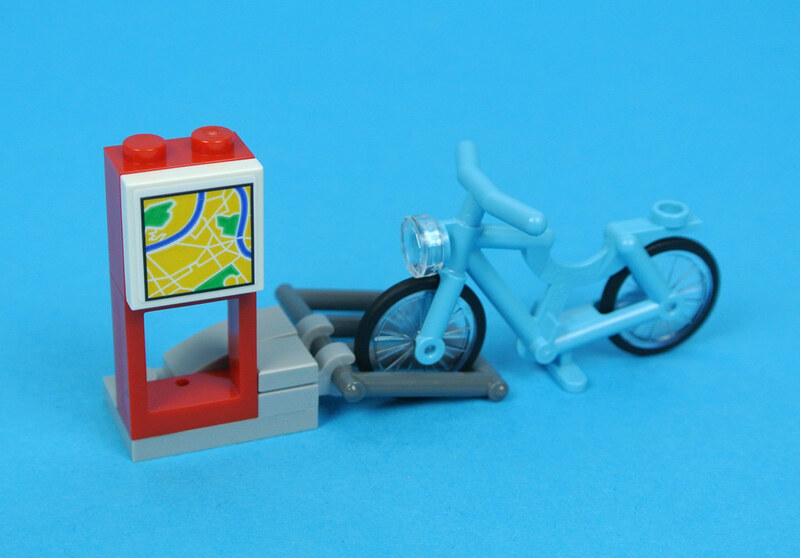 Bicycle racks like this one are quite prevalent in LEGO CITY, most recently appearing in 60154 Bus Station. The dark bluish grey lattice plate is effective and there is space to slot two bikes onto the rack, although only one is present in this set. A map is displayed beside the bike rack and features another sticker showing part of the city. It would have been nice to see a couple of recognisable landmarks based on other sets featured but the generic design of the map ensures that it can be used in many different scenarios. A few of the models included seem to be based around a park environment so should complement 60134 Fun in the Park - City People Pack very well. 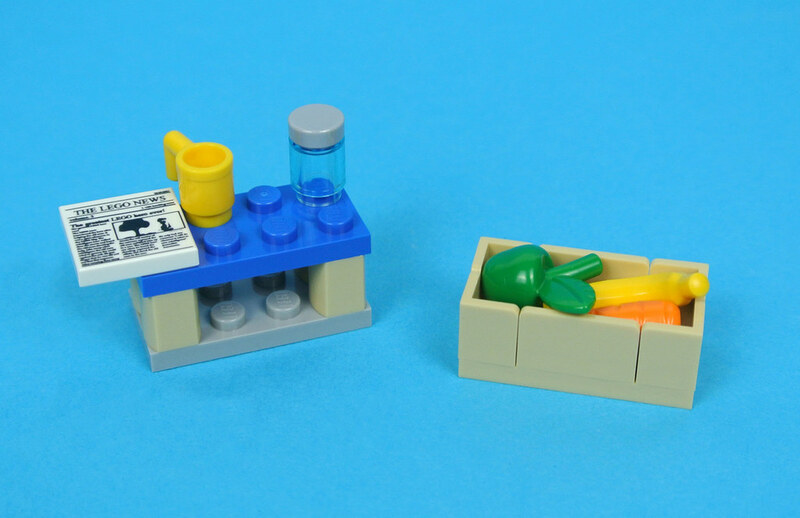 A selection of food elements are laid in a basket, most notable of which is a rare green apple, while some drinks and a printed newspaper tile are placed on a blue bench. The colours of the bench look rather mismatched to me but I am glad of the extra accessories. The park also includes some plants and a small fountain. These are very simple but I like the white inverted dome which forms the basin and the four 1x1 quarter circle tiles arranged around the fountain are very welcome too as these are relatively rare at the moment. Unfortunately, the fountain seems to have sprung a leak, presumably due to drilling nearby based on the inclusion of a dark bluish grey jackhammer! The parking attendant's booth is the largest of the nine models and is perhaps the most appealing as structures like this one have rarely been found in recent CITY sets. I like the hazard stripes on the barrier and a second sticker confirms that this is the entrance to a car park, as suggested on the box, but it could easily represent a simple toll booth if you choose to omit the sticker. 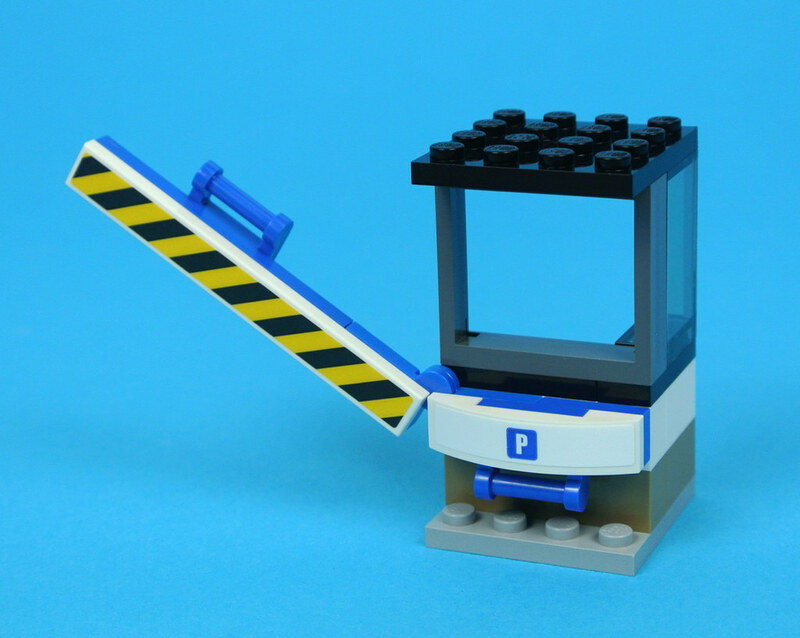 The barrier can be raised on a hinge and there is room for a minifigure to stand inside the booth, although there are no controls inside. This is an unusual set but a thoroughly impressive one! The small models remind me of gifts from a CITY Advent Calendar and are of a high individual standard, allowing you to incorporate them into larger displays with ease. The parking attendant's booth is probably my favourite part of the set as it is quite unusual and I also appreciate the inclusion of several rare pieces as well as some useful stickers. On the other hand, the pack contains few models which cannot be found elsewhere so its appeal may be somewhat limited to seasoned CITY collectors and the prevalence of stickers is a little disappointing. The absence of minifigures also reduces the playability to some degree, although the fundamental purpose of the set is to expand upon your existing collection and in that regard it is successful. The price of £7.99 or $9.99 represents excellent value and this is therefore a must-have set in my opinion. I found this in legoland resort in california. Price was $10.99 . and friends accessory set, too. Very nice! Some of these would look great in the NINJAGO City I'm building. I was excited when I first heard about this, but I'm not that impressed upon looking at the pictures. As much as I like scenery for my city, the bulk of pieces in this are not that rare. I feel like it's not worth the $10 price tag. Include even one minifig and I think it would be more worth it. The value is crazy. So glad I don't have to buy 5 different sets or hit BrickLink to get all those printed parts and rarer parts. I would love one for forests elements but this is fine for now. It became clear when fun at the beach was reviewed that small city accessories are unpopular. But I really like things like this. Small builds like a tiny ice cream stand, a picnic bench, a set of football (soccer) goals or (in this case) a set of traffic lights really give a city character. I think I'll bundle this in with my big buy of the jedi starfighter and a-wing from [email protected] later this summer. @Teriyaqi: sorry to burst your bubble, but there appears to be only one printed piece in this set, namely the not so rare newspaper tile. All the others are stickers, as mentioned in the review. It looks like the bus stop sign is printed as opposed to a sticker. Yes/no? There's a perfectly printed bus stop sign in Fun at the Park. Why go back to a sticker? I just have to get this. The value is great! @AustinPowers: Ah, I see now. I only skimmed the photos the first time around. Still, those are nice stickers for a small set. I didn't realize there were "green" apples and "bright green" apples. I have zero plain green ones, but 24 bright green ones. Bricklink shows it was only in two sets since 2004 (now 3). I'm a City guy, so I was pretty psyched when I first saw this set leaked a couple of months ago. Once I discovered they're all stickers, my interest plummeted. I doubt I would get this set, even on sale. they lost me at stickers. Nice. Very, very nice. The stickers bother me a lot less in a cheap little set like this as opposed to something huge and expensive ike the UCS Snowspeeder, and I hope for many more sets like this to adorn my city with. A nice surprise from LEGO. Yep i agree. The stickers are a real turn off. Does it really add that much to the cost?? This seems like a very interesting set. Not only is the lack of minifigures rare, but the set also comes with nine pretty nice models. If Lego can market this for £7.99 then why I wish they would get their act together with the City and Friends advent calendars which cost considerably more than £7.99 and yet consistently have much poorer models. yes I understand a lot of the cost is in the packaging of the advent calendars, but still this set shows up how bad a deal the City and Friends advent calendars content and prices are. The Friends one in particular last year was absolute rubbish compared to the Star Wars one. So much so that my daughter got a Barbie calendar instead. That said this year's SW one is a step backwards too. Any how this set looks worthwhile and complimentary too. I like it. The models do remind me of the city advent calendar. I like the pieces included and don't mind the stickers. It does look to be a great value. Looking forward to a review of the accessory pack for the Friends line. The set is a ripoff. There are no printed pieces really, even though there is a printed bus piece, and not even that many pieces. I can get 90 pieces including four firemen for $10. (Or $6.39 all the time). 76 pieces, three mini figures and a shark, for $10. Or 88 pieces and a croc for $10. I really don't get the point of this. At least the friends ones has 21 more pieces and two tennis rackets. @TGBG: It's got a hundred parts for 10 bucks, so I don't really see the problem. A bit disappointed with the set, but for at least 25% I'll bite. They should have specialized into either 'road signs' or 'sidewalks' items since buying a few of these won't make much sense (how many parking entrances or potholes can you really have in a City?). Thanks for reviewing this. I too had never heard of just plain green apples. Although I hate stickers, I will not let them turn me off this set. I can't wait to get it. Will this be a Lego Store exclusive? Or will it be available at say Toyworld? The only problem with this set is that, knowing Lego, it will probably be like $20 AU. This is off topic, but I will ask anyway: Have any Australians seen City Auto Transport Heist 60143 anywhere other then online and at the Dreamworld Lego store? It was $69 at the Dreamworld store. $69! Hopefully 60143 and this 40170 will be available in shops other then Lego Certified stores. In Australia, Lego store prices are absolutely ridiculous! 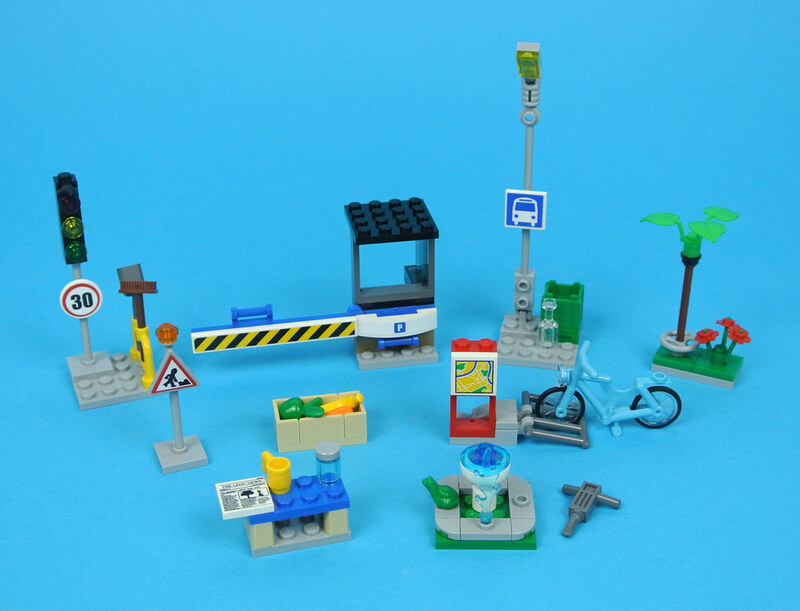 I quite like sets like this, in terms of scenery for your Lego city ... but too many stickers, Lego. It's reaching epidemic stage. And some of these had been printed pieces in the past, which is weird. Thanks, CapnRex, for another great review and set of pictures. I'm not that into City, but if I were, I would go for this set. I can imagine these accessories adding an extra level of detail to a city scene. Admittedly, the stickers are disappointing. The fountain isn't broken. The 'leak' is in fact a feature that allows you to drink the water. A pedal by the base of the fountain is depressed diverting some of the water to a spout at ground level that shoots the water to about chest height. There's a fountain like it (or at least there used to be) in Kensington Gardens. Brilliant. Hopefully there's more sets like this. Very useful parts. I don't mind that there's no minifigures, I have enough of those. When I first saw the box-great! Out of the box- Yawn, was it all. 'Build My Flora & Fauna Accessory Set' please !!! And also a Friends one. @Zander - You may well be right but the instructions suggest that the drill and the fountain are in some way associated so I assumed that drilling had caused a water pipe to burst underground. I suppose it could serve as either. One, I'd like it if Lego Trees became more commonplace. (Do they even make them anymore, or are trees all brick-built now?) 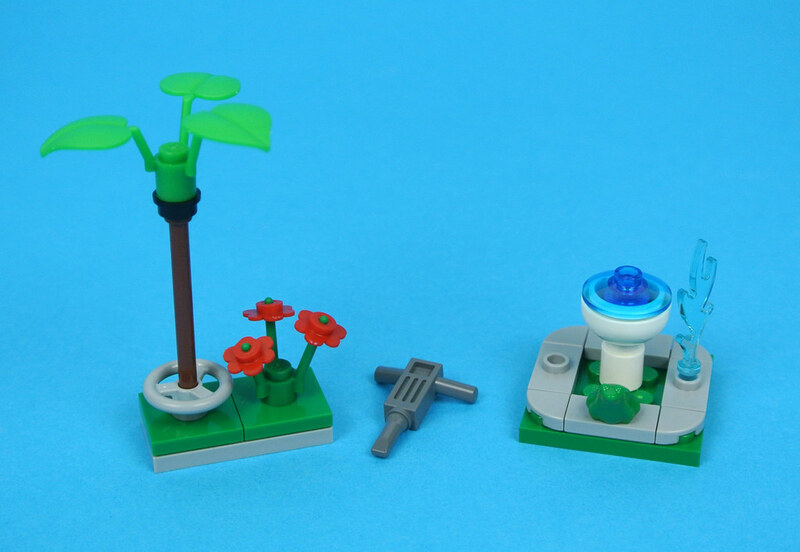 This is not the first time Lego has made accessory sets, and trees were often a staple in those. Two: I'd love a Super Heroes equivalent of this. In some ways, DC and Marvel Super Heroes have just become City sets with a higher action element. I wouldn't mind seeing something like this, but maybe with a super heroes twist...like batcave accessories. I really love the "fun in/on the..." sets, and this one's pretty good too. They hark back to a time when people were encouraged to make their own town layouts at home. Hopefully this is only the start of what will become a very good trend for City (and possibly Friends, but I care less about that). I like it, but I do agree that there should be more models in it that haven't appeared in other City sets. I think I may try to get this set. I am not sure what will I do with the parking booth though, as I have the 2012 car park set.